Dog cherry eye surgery is recommended by veterinarians and dog owners may want to learn more about this procedure. Although unsightly, cherry eye in dogs is not a painful condition, however, left untreated, it may lead to complications. Many dog owners also wonder about dog cherry eye surgery costs. These costs for dog cherry eye surgery can vary widely based on several factors and may range between $300 and $1,000. Veterinarian Dr. Ivana Crnec offers information about dog cherry eye in dogs, the surgical procedure and prognosis. One minute your dog looks normal and perfectly healthy and few minutes later a pink, round and glistening mass may appear in the inside corner of its eye. Although not painful for the dog, the large, reddish to pink tissue that pops up from the eye is scary and unsightly for dog parents to look at. In a nutshell, a dog’s third eyelid is not normally visible. However, if for any reason, the gland behind the third eyelid swells, both the gland and the eyelid protrude. The condition is popularly known as “cherry eye.” To better understand what happens it helps to take a closer insight into the anatomy of a dog’s eye. The dog’s eyeball sits deep in a bony socket. It is cushioned on a layer of fat and supported and protected by the two eyelids. Eyelashes, which grow only on the upper lid, help to prevent foreign objects from coming into contact with the eyeball. A third eyelid, called the nictitating membrane, functions like a windshield wiper, brushing debris from the cornea (the transparent, tough surface of the eye). A film of tears constantly bathes the third eyelid and the conjunctiva, the membrane that lines the eyelids. Tears ensure clear vision, prevent the eye from drying out and fight infections. Excess tears drain via a channel called the nasolacrimal duct into the nose. The third eyelid, also called the haw or the nictitating membrane, does for a dog’s eye what our index fingers do, less effectively, for ours. The third eyelid moves up from within the lower lid and mechanically sweeps the eye, removing small foreign bodies and minor irritants. If you watch your dog as it falls asleep, you can actually see the third eyelid move over the eye even before the eyelids are completely closed. The lower lacrimal gland, which forms part of the third eyelid, produces roughly half of the eye’s tears. The third eyelid or nictitating membrane consists of mobile cartilage covered by conjunctiva. Behind the cartilage, on the eyeball side, is the lower of the lacrimal glands which is properly called the “nictitating membrane gland.” For reasons that are poorly understood, this gland sometimes swells to five or more times its normal thickness. As it does so, it lifts the nictitating membrane away from the surface of the eye. Once this problem occurs, the continued swelling of the nictitating membrane gland causes the third eyelid to flip over. The gland appears as a round, glistening, pink mass in the corner of the eye. 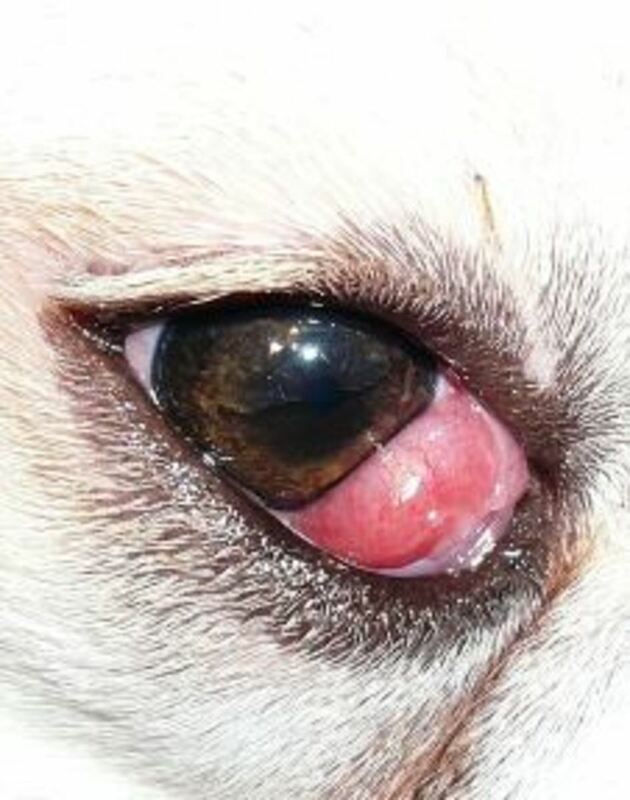 Based on its appearance, the condition is commonly called “cherry eye.” Once exposed, the gland can irritate the cornea, causing conjunctivitis until the cherry eye is treated. Because of the condition’s prevalence in certain breeds, it is believed that a genetic component exists. Simply put it is postulated that a genetic abnormality leads to weakening of the fibrous attachment that holds the gland in its natural anatomical place. Once the fibrous attachment becomes loose, the risk of protrusion increases. It should be noted that dogs that have had a cherry eye in one eye are at higher risk of developing the same condition in the other eye as well. Although cherry eye can occur in any dog breed and at any age, the condition is more frequently seen in: young dogs under the age of two, toy and teacup dog breeds, terrier breeds, breeds with shorter muzzles and brachycephalic breeds (with squished faces and ridiculously short legs). The following breeds are at highest risk: basset hounds, beagles, bloodhounds, Boston terriers, boxers, bulldogs (English and French), bull terriers, cocker spaniels, Lhasa Apsos, Neapolitan mastiffs, newfoundlands, Pekingese, poodles, pugs, Saint Bernards, Chinese shar peis, shih tzus and West Highland terriers. What are the symptoms of cherry eye in dogs? The condition can have two different clinical presentations: It may present as a large, red mass that covers a significant portion of the eye and persists continuously, or it may present as small, red mass that appears periodically and fades away on its own. Pawing, scratching and rubbing of the eye (thus increasing the chances of further irritation and bacterial or viral infections) increased tear production and secretion. Dog cherry eye surgery costs vary based on location. In spite of its unsightly appearance, under normal circumstances, a cherry eye is not painful. However, depending on the size of the protruded part, it can cause a certain level of discomfort. On the flip side, if left untreated for a longer period of time, a cherry eye can lead to serious and painful complications. Therefore a quick approach and a proper treatment strategy are of paramount importance. In a very small number of cases, the cherry eye can resolve on its own. However, in those cases the chances of future re-prolapses are particularly high. If caught early enough, the condition can be successfully resolved with closed-eye massages, antibiotic and steroid eye drops. Once again, the chances of future re-prolapses are fairly high. Removal of the gland – due to its simplicity this procedure was routinely performed in the past whenever a cherry eye patient presented. Nevertheless, today this type of surgery is strictly forbidden. This is because the third eyelid gland is responsible for producing up to 50% of the watery portion of the tear film. Consequently, if the gland is removed, the dog is at risk of developing a so-called dry eye. To compensate for the loss, dogs with dry eyes require lifelong application of artificial tears. Replacement of the gland – the procedure involves suturing the tissue around the prolapsed gland thus creating a pocket or envelope that will encase the gland. Although much harder to perform than the previously described surgery, this method is much safer, with higher success rate and consequences-free on the long run. What’s the prognosis for dog cherry eye surgery? In almost all uncomplicated cases, the gland returns to its normal functioning only a few weeks after the surgery. Unfortunately, re-prolapses occur in about 5 to 20 percent of the cases. Consequently, if a re-prolapse occurs, the patient is subdued to an additional corrective surgery. Can cherry eye in dogs be prevented? Unfortunately, due to its genetic component, cherry eye cannot be prevented. Once it develops it needs to be medically addressed. Taking your dog at the vet’s office as soon as possible increases its chances of successful treatment and easy recovery.